Professor Layton and the Azran Legacies is the last game in the prequel trilogy and is heading to European shores this year, while North Americans will get their puzzle fix in 2014. It's been out in Japan since February and is largely seen as the last ever Professor Layton title, although that may not necessarily be the case as Level-5 President Akihiro Hino revealed at the Japan Expo earlier this month he wants to make a brand new Layton adventure. Hino said he is pleased with the latest release but doesn't want the series to come to an end just yet. Should Level-5 create another title, Hino would like to include a host of new challenges for the legendary scholar to complete. At the same event, Hino also confirmed something was "in the works" regarding the localisation of Professor Layton vs. Ace Attorney, but couldn't give any further details. 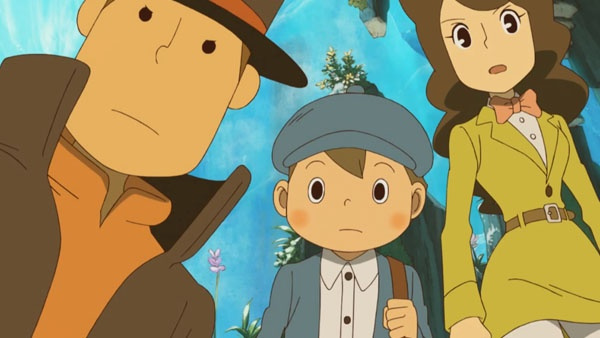 It looks like the Professor Layton franchise may not be over after all. Will you be hoping for more after Professor Layton and the Azran Legacies? Let us know in the comment section below. As far as I remember, they never said the series would end after the sixth installment. They just wanted to let the Professor retire, leaving the possibility of further sequels without Layton himself, and as far as I can tell, this "news" doesn't contradict that notion or bring anything new to this subject. New trilogy featuring Layton's long-lost twin cousin, Notyal. Yes! I would love to play another one! Layton never disappoints! Great idea, maybe cross it with, let's say, Ace Attorney, and then bring it to Europe, together with Time Travellers. Oh and one important detail: DON'T make it download-only! And make it English, spare yourselves the cost of Dutch trans-Laytons. Here in Flanders we only got Dutch versions and I hate that. So far, I only played the Curious Village, because it was in 'Inglish'. Wow,I'm suprised @Prof_Clayton hasn't commented on this article yet. Anyway,I've never really played a Layton Game before. Looks nice,I would love to play one. o god...........so excited. One of my favorite franchises ever. I really hope we get Layton vs Wright. I guess they will come up with more iOS-stuff. You all have no idea how happy this makes me. Think the Dragon Quest are the best games they have done. Rather have anything else they have done than Professor Layton (Time Travellers / Inazuma Eleven). Just bring youkai watch to the west!!!! You certainly won't hear any complaints from me! I loved playing The Last Specter and wouldn't mind diving further into this series. Also, as someone else has said, I wonder when they will bring Youkai Watch to the west. That game is looking amazing and it would be a shame if it wasn't released outside of Japan. I'll remain hopeful for now at least. I really like Layton games but they need yo take a break. They're too similar to keep releasing them on a yearly basis. Oh, and bring Layton vs AA to the west. This is the best thing that has ever been said ever in history. Nothing has ever made me happier. Also, in response to the series needing a break... Well, it's not like they have much replay value, once I've solved a puzzle I know the answer (unless I get amnesia), so what else will I do? Sure, there's other game series I play, but as a big fan, well... There's no really alternatives to this game. Sure, there's other puzzle games but they rarely have the variety of the Layton puzzles so they can get repetitive quite quickly. It's not like Guitar Hero, which was all about replay value so you can continue to replay the same one for a couple years. For a fan like me, nothing is more exciting than a Layton release and the couple weeks I get out of a new Layton game is the best time of the year! Of course, I do understand it's not the most popular series ever, I just really don't the series to take a break. I already have to wait long enough for Metroid, Kingdom Hearts, and Smash Bros, Layton is the only series I love that I have gotten fairly consistently and I am really hoping this means we'll get more of it! Level-5, please stop toying with my feelings like this. I'm glad to hear there may be more Layton, but stop playing with my heart like a yo-yo. Thanks! "Introducing Luke Triton as the Professor!" A Professor Layton and Rhythm Thief crossover is something I would like, but after some events, that seems unlikely. I will always want more Layton games. When I first heard this news, I can't remember just how excited I was. If the series does move onto the Wii U, however, I'd also like it to remain on the 3DS. More Layton, yes! What about Layton vs Phoenix Wroght? What? @Prof_Clayton hasn't commented yet? He must have died from the shock of the announcement. Who will lead the Swapnote Battle League now? Level-5, do you even remember making Dark Cloud or Dark Cloud 2? You seem to never ever ever ever mention it. I want an hd collection for the wiiu of the past games!!! Plus new games with a cross play potential... yes please! Great news. Professor Layton is one of the most charming video game series I've ever played. Here's hoping an eventual next trilogy comes to the Wii U.
I'd love for them to make a seventh game, set after 'Lost Future' to tie up any loose ends and finish it there on a high.